Friday 08. 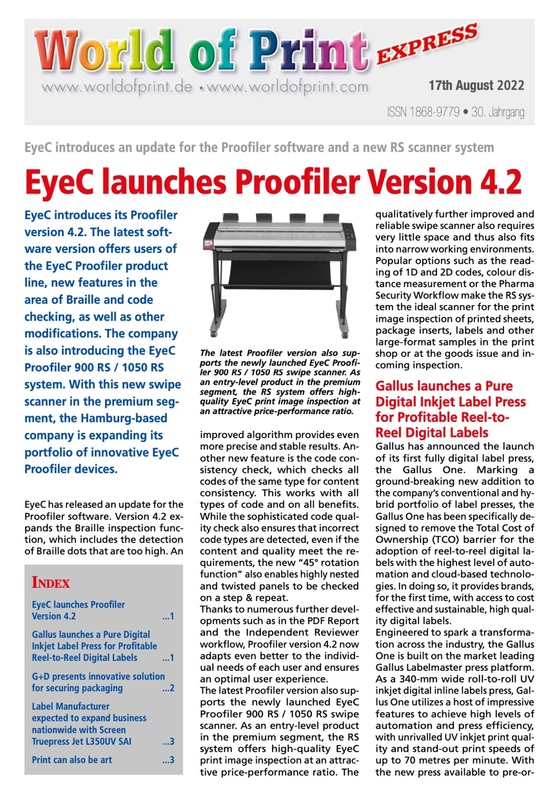 December 2017 - Electronics For Imaging, Inc. (Nasdaq:EFII) has announced commercial availability of its newest launched printer, the EFI Pro 24f. First exhibited at the recent SGIA Expo, it is the only dedicated flatbed wide-format printer featuring EFIs proven LED and variable drop greyscale head technologies. It provides precision imaging, fine detail and outstanding image quality for a broad range of applications. U.S. customer Superior Signs & Engraving in Wichita, Kansas, is the very first user for the printer. The printer’s premium quality imaging capabilities, with white ink included, and the high versatility and productivity of EFI’s “cool cure” LED technology, have vastly improved throughput and quality at the company. While quality and speed were key considerations for Superior Signs & Engraving, Stiles and his team also benefit from the printer’s ability to accurately and consistently handle a broad range of substrates. “The features that are a nice upgrade for us besides the colour quality and speed are the button activated media guides and the media float button,” Stiles explained. “When positioning heavier medias such as 6-mm Dibond and ¼-inch acrylic, the float allows us to easily position the material without having to worry about sliding it, especially on double-sided prints. The printer is the newest addition to EFI’s growing wide-format portfolio, a dedicated flatbed device perfect for applications requiring discerning image quality and absolute dot placement accuracy. A highly strategic choice for signage, photographic backlit displays, art reproductions, membrane switches, graphic overlays, lenticular prints and other specialty applications, this printer’s 1.2 x 2.4 metre flatbed architecture features a multi-zoned vacuum system that eliminates masking while ensuring accurate registration for multiple over-prints or panels. EFI’s “cool cure” LED technology ensures low power consumption, minimal waste and compatibility with thinner and heat-sensitive substrates. The printer’s built-in EFI Fiery proServer Core digital front end gives users the power of faster job processing, along with a host of colour management and production options for a complete, turnkey solution. Demos and print samples from the new printer are available at EFI’s European and U.S. inkjet demo centres in Brussels and Meredith, New Hampshire.